While there are numerous cosmetic dental solutions available, only veneers can permanently transform your smile in as little as two visits. These thin yet durable shells can be used to address several concerns at once, including permanent stains and minor chips. At Anaheim Hills Smile Studio, Dr. Azita Adelynia offers veneers for patients looking to achieve a brand-new smile. To schedule your consultation for cosmetic service or veneers in Anaheim Hills, call our office today! Veneers are recommended as restorations for patients who would otherwise be stuck with permanent flaws. During a thorough consultation and exam, Dr. Adelynia gains a full understanding of your oral health and aesthetic goals. Whether you choose porcelain or e.max®, you can trust that your smile will regain a healthy and beautiful appearance, without sacrificing function. Dr. Adelynia collaborates with a trusted local lab, who can ensure that the shade of your new teeth matches the rest of your smile, allowing you to maintain a uniform smile. 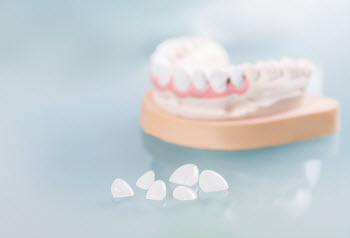 We also offer teeth whitening solutions which further allow your veneers to blend in seamlessly. Both porcelain and e.max® are valuable to cosmetic treatment plans because of their resemblance to natural enamel and their resistance to staining. If your entire smile could use a cosmetic adjustment, Lumineers are designed to completely transform every visible tooth. This is ideal for those looking to achieve ‘Hollywood’-style effect just in time for a big event. Our team at Anaheim Hills Smile Studio works with you to achieve the smile you deserve. If your smile contains imperfections which prevent you from smiling with full confidence, dental veneers and Lumineers may be the solution for you. These thin shells can address many structural and cosmetic issues and leave you with a smile you can proudly share. For more information or to schedule your appointment for veneers in Anaheim Hills, call Dr. Azita Adelynia at Anaheim Hills Smile Studio today!